I am curious to try the food in Hawaii, but I’ll admit my expectations are low. It seems like all of the fresh fruit and seafood would make for wonderful dining, but I am still traumatized and slightly insulted by the notion of Hawaiian pizza. I truly can’t imagine anything more disgusting to do to pizza than top it with ham and pineapple. What’s up with that, Hawaii? I have been fortunate to travel a bit in my life, but I have never set foot in the Pacific Ocean. We briefly considered Tahiti for our honeymoon, but settled on the much more “sensible” for east coasters St. Barth’s. And somehow I knew that if I didn’t make it to the Pacific on my honeymoon, I wouldn’t get there until I was much, much older. Even as a starry eyed soon-to-be newlywed, I knew how life worked. Flights are long and expensive, vacation days are limited. I was hopeful that eventually my day would come. 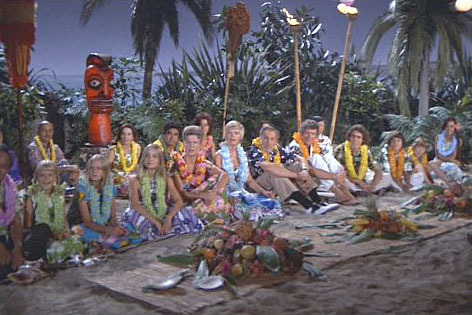 I still remember being in second grade, watching the Brady Bunch gleefully hit Hawaii on our crappy old staticky TV. It was my very first Liz Lemon “I want to go to there” moment; I didn’t even care that all kinds of horrible things happened to them there. Hawaii was propelled to the top of my list of places to visit, where it remained for the rest of my life (unlike Disney World, which was removed from the list by age ten). Alas, going to Hawaii was about as feasible as owning my own horse, which is to say only slightly more feasible than my anti-gambling mother hitting the lottery. When I tell you this is my dream, I am not being melodramatic. This really is my lifelong dream. And here it is! I don’t even mind that I’m closer in age to Alice than I am to Marcia. 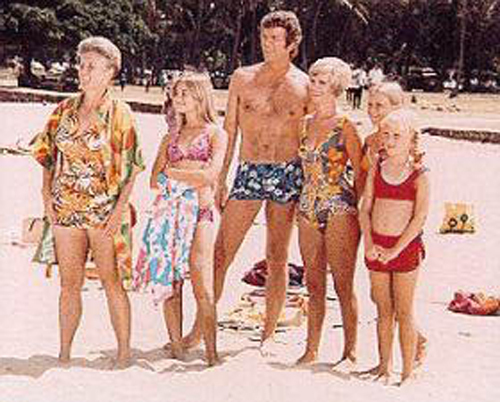 This entry was posted in Life and tagged Brady Bunch Hawaii, Hawaii, travel by Mom Mom's Apron. Bookmark the permalink. Have a wonderful wonderful trip! Must have details and pictures when you get back please! I love Hawaii!! Have a wonderful time. Looking forward to hearing all about it. My stars have alined twice in my life for two very different types of Hawaiian vacations. Hope you have fun. I would go back again for a third trip and would even take the kids (if they could fly unaccompanied in the regular part and Jay and I could fly first class).